Hello, everyone! Jenifer here; Ryan's "allergical" to Sweden, it appears, so I'm writing the first post! Aside from the abundance of pollen (oak and birch), the beauty and easygoing attitude of Stockholm is amazing! After essentially pulling an "all-nighter" between the flights and time-zone changes, Ryan and I wandered our way into Old Town (Gamla Stan) Stockholm to find our bed and breakfast for this leg of the trip: Bacchus B & B, an eleventh-century warehouse that has been converted into a comfortable home for our hosts, Pär and Anne and their 6 children (only some of whom are home at any given time). The home is amazing and the hosts are even more amazing. Upon arriving nearly unexpectedly (early), Pär and Anne welcomed us into their home immediately, and we spent 3 hours chatting and getting to know each other. We're their third guests; they have just started opening their home to travellers. The house is incredible with modern Scandinavia style and sensibility--every useful object is also an object of great beauty. They have a wonderful philosophy of living that mirrors Ryan's and mine--to say the least we get along wonderfully! After spending the morning chatting with our hosts, Ryan and I did an easy walking tour of the city--from Gamla Stan across one bridge into the main and modern part of the city (where you will find many Radisson hotels, if that's more to your liking), Norremalm, followed the waterfront into Ostermalm--which is apparently where rich old ladies live with incredibly small and pampered dogs--and crossed another bridge over to Djurgarden which has a large outdoor museum of all things Swedish called Skansen. We actually walked around it, because we were too tired to enjoy it at that point. After walking around the island, we walked back toward Gamla Stan, but decided that we felt "up" enough to continue our city tour, so we headed across a bridge to the south of Gamla Stan into the "hip and funky" Sodermalm. Of course, Sunday was the big day for Sweden vs. Germany, and many people--young and old--congregated at outdoor cafes, pubs, and just public parks to watch the game on big screens. Everyone was decked out in yellow and blue, hopeful for another victory. Sodermalm was particularly active with so many excited young people cheering and jeering as the game started. But, by this point we'd walked about 8 miles and were completely exhausted. We got Chinese take-away and headed two miles back home. After eating, we slept for 14 hours. Upon awaking, we went downstairs to a wonderful breakfast. It was simple and abundant. We ate our fill, and during breakfast our hosts informed us that they were going to spend the morning and lunch on their boat, harbored outside of the city. 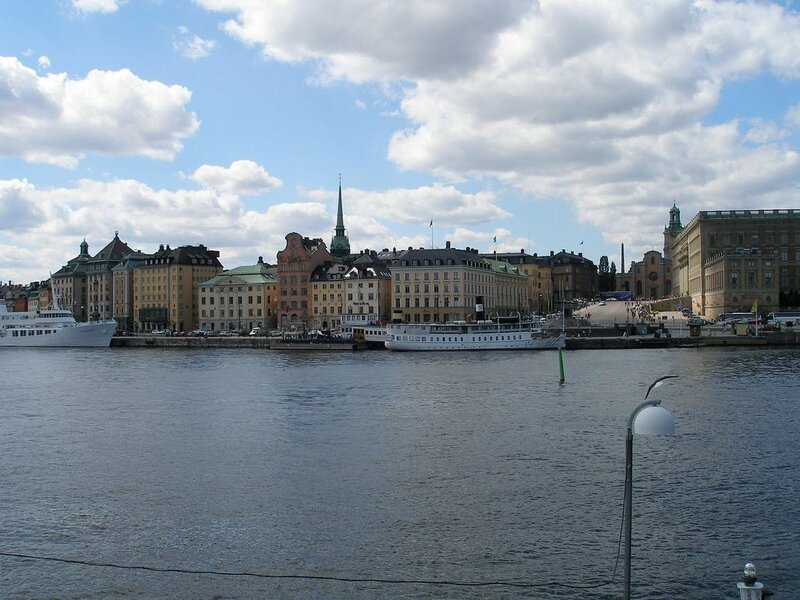 Anne needed to come back into the city to open their small home-decor shop for the afternoon, so Pär offered to pick us up at her drop-off point on Skeppsholmen, a small island between Gamla Stan and Djurgarden (Stockholm is a series of 14 islands). After breakfast, we headed out to soak in some mid-summer ambiance on Skeppsholmen, where a number of locals were picnicking, overlooking the archipelago and the amusement park on Djurgarden (something that may tempt a few friends to Stockholm!). We wandered the island a bit longer, and then went to the dock where we would meet Pär, Anne, Pär's son Michael, and Anne's daughter Sophie. 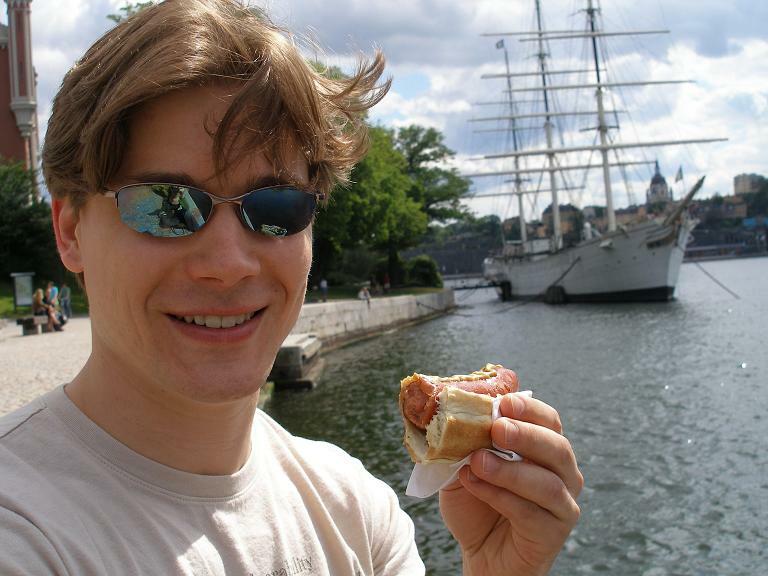 Ryan managed to get hungry and decided to partake in the rare Swedish delight: a hot dog from a street vender. I took pictures. In short order, our hosts arrived, dropping off Anne and Sophie and picking up two eager American tourists. They took us on a private cruise of the canals, leading through the archipelago and into part of the Baltic, and then headed back to their marina. It was a wonderful ride. Just the prior morning, Pär had explained to us how "trustable" Swedes are, and of course we believed him! So far, everyone we have met have been exceptionally welcoming and helpful, fluent in English (even young children). And then, that boat ride, well, we might have begun to think otherwise. There was a strong current in the channels and a lot of traffic. Midsummer is a major Swedish holiday, and the warm weather and bright skies had everyone with a boat--from grand sailboat to small rubber rowboat--out on the water. 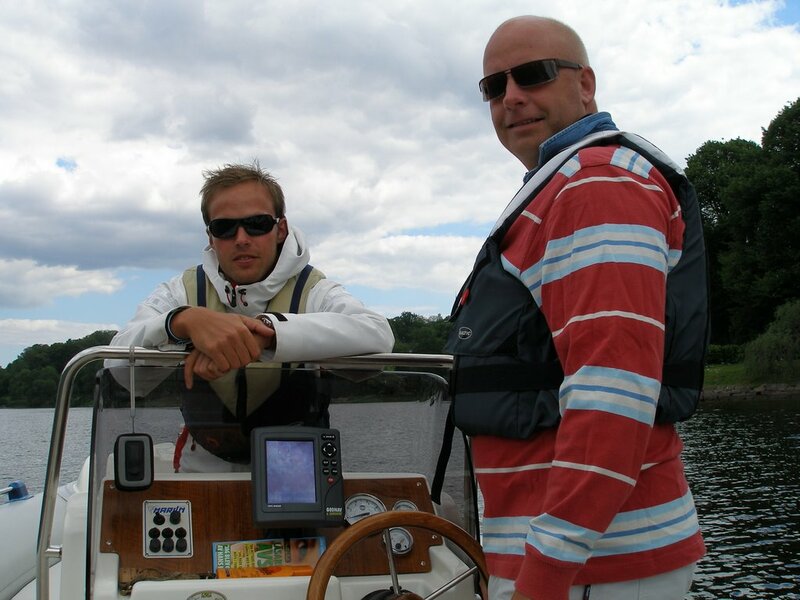 This traffic caused a lot of wakes, which after Pär encouraged us to move to the front of the boat for a better ride, as well as a dry one, a wake came over and well, you can imagine. Michael joked: "I can't believe they fell for it!" We all had such a laugh and it was only a matter of a couple of minutes before we were dry again under that bright sun. It was a beautiful day to be on the water, and for part of the journey-- once we were out in the open--we were able to go about 30 knots, which was quite a thrill. Once arriving at the marina, Pär drove us back to Gamla Stan in his convertible VW bug--it was truly a beautiful day. You see, we went to dinner. Our hosts recommended a small cafe on the main square where they served traditional Swedish food. They made me a plate of root veggies--turnip, parsnip, beets, carrots, and new potatoes with a lingonberry sauce and two nice blocks of cheese--and Ryan had traditional Swedish meatballs. The owner of the shop brought out a couple of shots of homemade schnapps, and of course, as it's midsummer, I had to partake. After a joyous 'Sköl!' i downed that sucker. First shot ever. When in Stockholm, go on boat trips and convertable rides and drink schnapps! We met an American couple and a Norwegian couple, basicly talking the night away, with a few special breaks to visit the toilet, which is against the 11th-century fortification of Gamla Stan--the wall that protected the Swedes from those horrible Danes. Our waiter was thrilled to tell us the history, and he said "around here, the walls speak history to us." So far, we're having a fabulous time as both the walls and the people tell us their stories. Trust a Swede and get wet! Keep them at arm's length at all times, and watch your meatballs closely. Glad to see you got there in one piece. Sad to see Ryan is laid up with Swedish Flu (made that up, I did). Hopefully he'll acclimate soon. As far as I can tell, Vikings don't get head colds or allergies. Something fishy about that Rasmussen. Sarah here from yoga at the Y. Mark gave me the link. I told you I am a total blogaholic, and I'm mostly Swedish, and I've been where you are so I had to read. Wonderful trip you are having! Hope it continues to go well. Oh yes, and if you should decide to follow the link from this comment back to my ever-so-boring parenting blog, please don't be offended by the things I have written about yoga class and you. In fun (I swear) I have nicknamed you the yoga-nazi because you are a tough (but GREAT)instructor. How did you hook up with your hosts? Sounds like a wonderful way to spend sometime, and they sound like lovely people. Andrew aka GreenJello Terror of the Highways. Hey Green Jello! We found our hosts at the last minute through www.stockholmuptown.com, or something similar. They recently opened up their house as a bed and breakfast. I highly recommend accommodations like these when traveling in Europe. But, we did get really lucky to get such wonderful hosts.